At this point, we have a system that exemplifies a functions-only, event-sourced architecture. 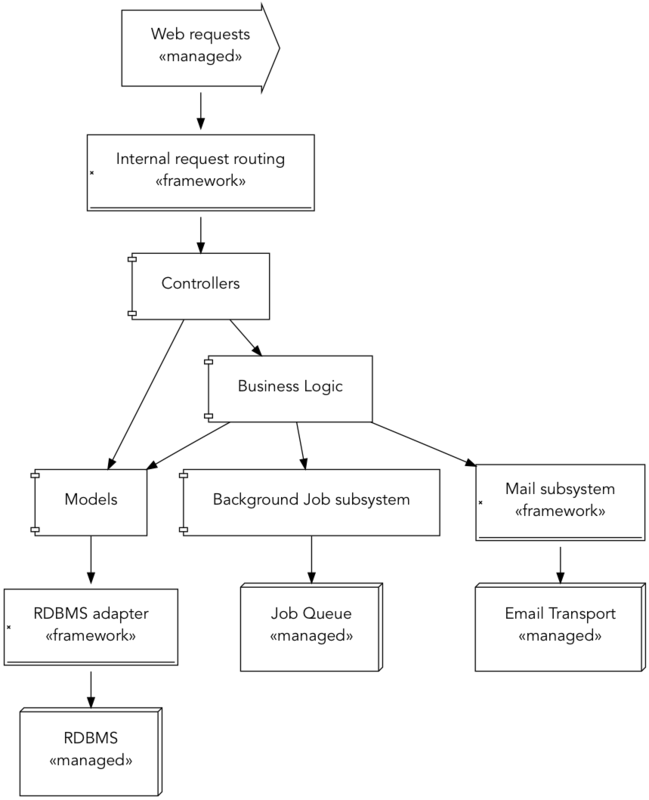 We can see the advantages in separating plumbing (like routing web requests) from our business logic. If we assume that our cloud service provider (like AWS) handles that plumbing and event-routing for us, that means that the thing we deploy to production is a bunch of functions that adopt a protocol. Our cloud provider will be in charge of making them execute. We've seen some benefits from a system design perspective, but this also has great operational benefits. I've been pedantic about framework-provided subsystems for a reason. Because we are asking our hosting provider to run our entire application, we are responsible for the operations of that application including the framework and library code. Our hosting provider doesn't care that some open source team maintains our database adapter—we are the ones choosing to run it in production. If we compare that to our functions-as-unit-of-deploy, there's less stuff to manage, and each function has a smaller footprint. Consider if our tiny application was implemented as an MVC-style web framework. We would need to have visibility into the behavior of every piece of the framework as described in the above diagram. To understand how our application performs, we have to examine both our code and the framework code. If you've used an Application Performance Monitoring (APM) tool like New Relic, you know how complex this can be, especially if your web framework or programming language doesn't have a lot of hooks for it to instrument. Monitoring our system becomes monitoring each function independently. We don't need to add custom tracing in our code because it's naturally separated as deployable functions, and our cloud hosting provider can provide APM-style insights. Each “thing we are monitoring” is simpler - instead of monitoring one large application with many subsystems, we are now managing three smaller functions with few subsystem each. For example, we don't have to worry about email or request routing when examining the saveEmail function. Because we don't have one integrated system, we no longer need to use a framework. We can use the best RDBMS adapter, the best email subsystem, the best HTML rendering engine for the problem at hand. While an integrated web application benefits greatly from an integrated framework, our “free functions” don't, so we can use different libraries if it's warranted. To change any given function, we only have to deploy that function. We don't need to run a test suite of the entire system just to deploy a change to one component. As long as our functions conform to the protocol, we are good (this is not without downsides, which we'll get to in a later chapter). There are theoretical cost benefits, too. Our function that renders HTML likely gets called a lot, but our function that sends email likely not nearly as much. The way most Faas providers work, you only pay for when your function executes, as opposed to paying for server processes or virtual machines that are always on. So, a serverless architecture based on event-sourcing, hosted by a cloud Faas provider has many advantages that we've seen. The programing model is attractive, the operational model is simplified, and it could cost less. There can't be any downsides, can there?